Hey hey hey! How goes it? Things are good up here, except for.....SNOW!! That's right, the snow has started to fall. No more doing things outside for another 6 or 7 months. Goodbye sun and goodbye warmth. Now that we are moving into the holiday season, I have a holiday collection for you. 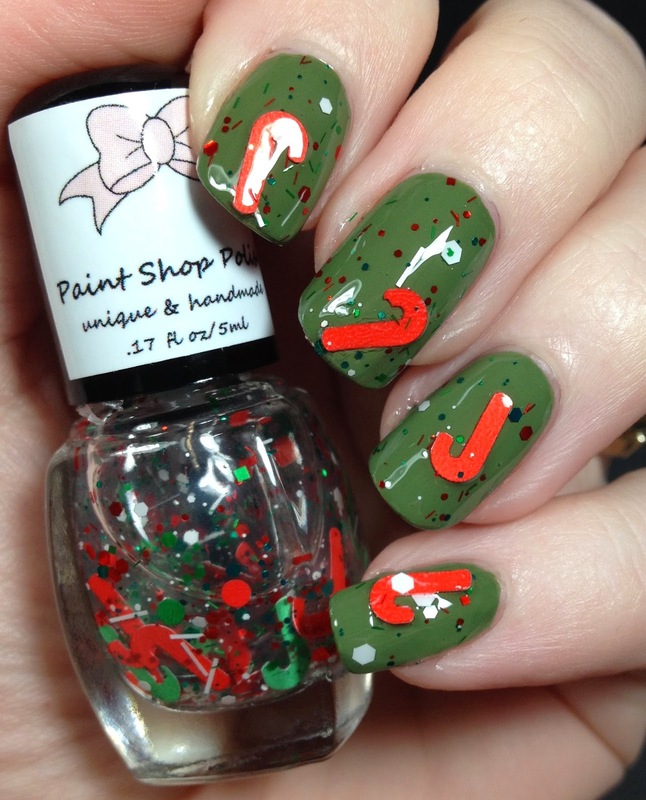 This time it is from a new to me brand called Paint Shop Polish. The owner was kind enough to send me four mini bottles to review. First up is Snow Angel, which is the first one I was drawn to. I used three thin coats to achieve this look and I topped it with Glossy Glam. 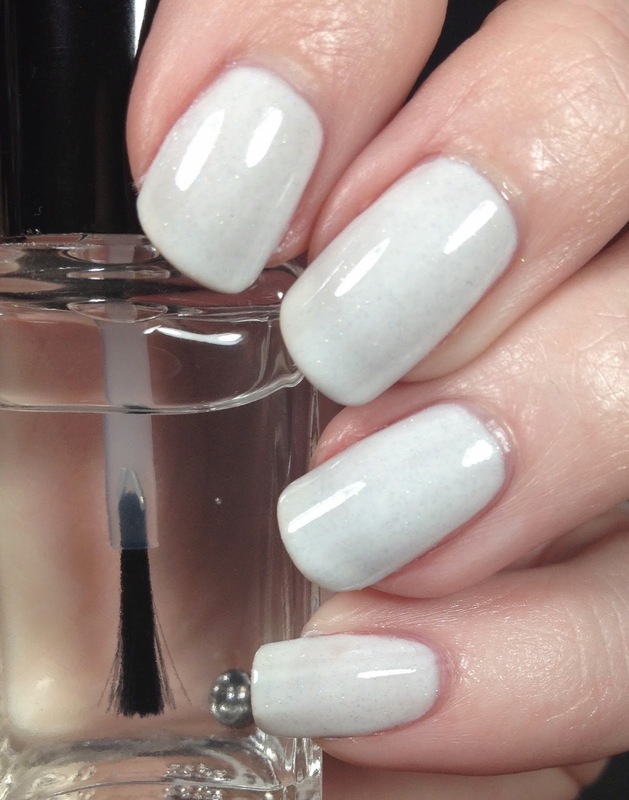 The description given is a " limited edition white creme polish with a beautiful scattered holographic shimmer. 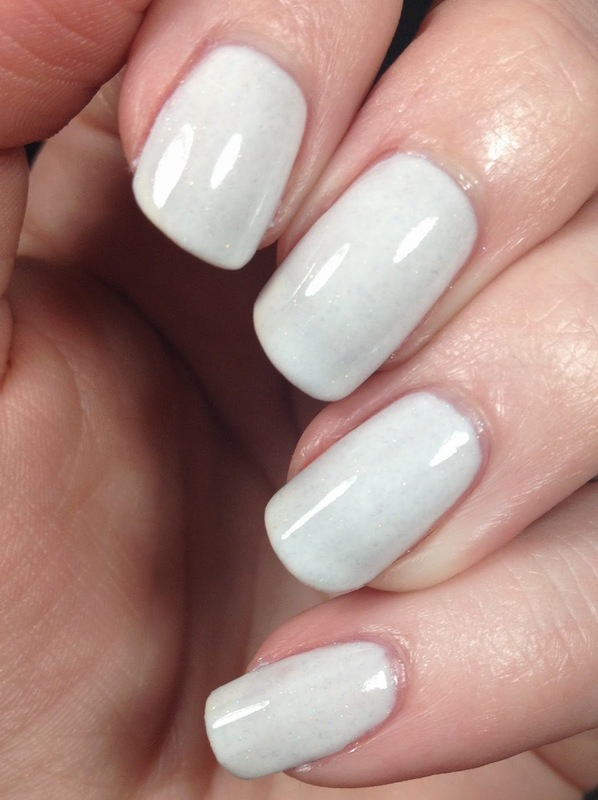 The perfect winter white!" The formula was nice on this one. Next up is Nice List. In the bottle I thought this look similar to Snow Angel, but it is actually very different. 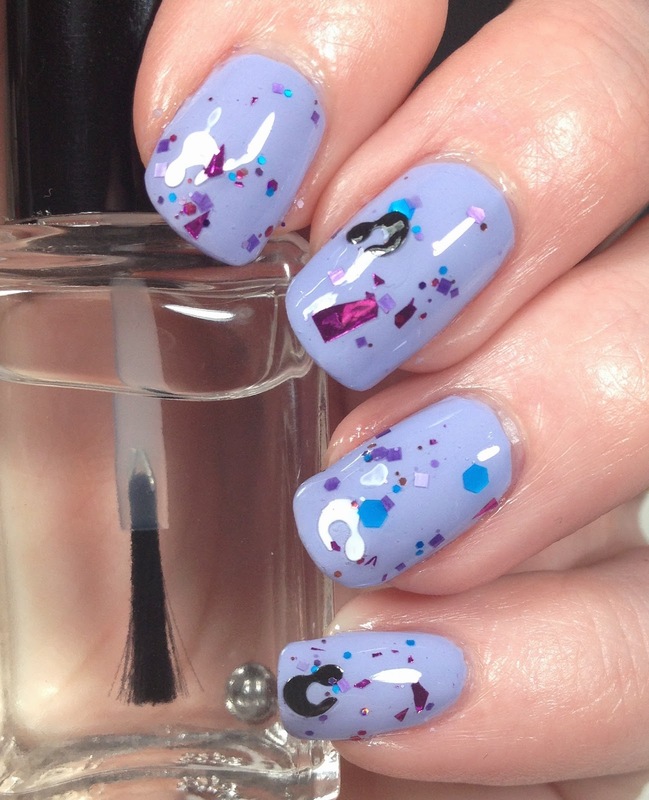 It is super sheer and here I have four thin coats topped with Glossy Glam. 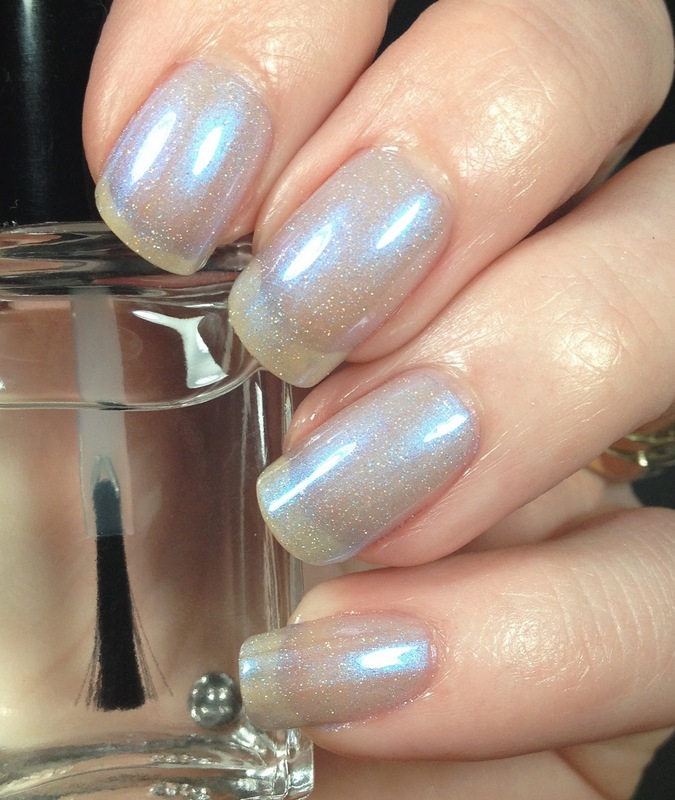 The shop describes this as " a limited edition light icy blue polish with a beautiful scattered holographic shimmer. Wear this one on your next skiing trip!" 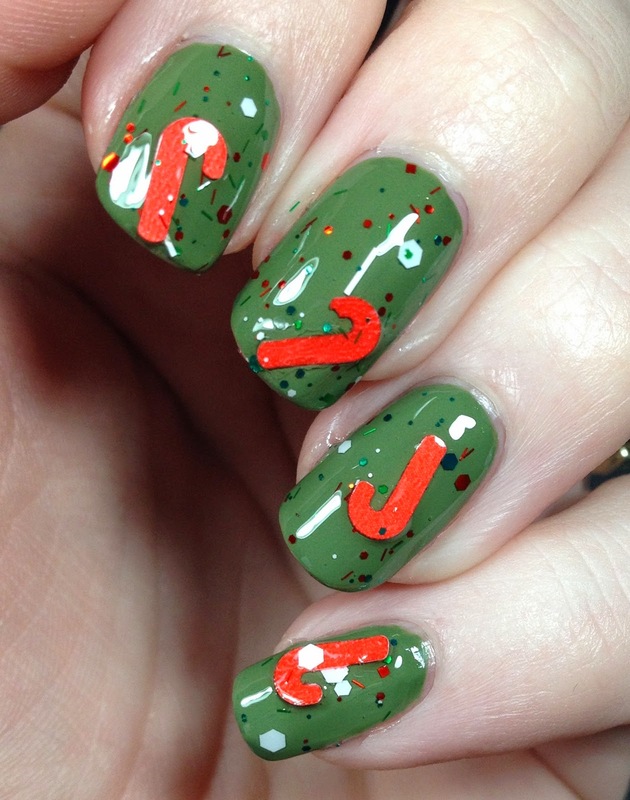 If visible nail line bothers you, then this one is not for you, unless you layer it over another color. I actually liked the look. Formula was nice on this one as well. Here we have Royals. This is my first bottle of leopard spot glitter, so I was excited to try it out. I did figure out the down side to it though.... they are hard to get out of the bottle. As you can imagine with that much surface area going on, a little fishing was in order. Part of it may because it was a mini bottle. It was pretty no matter the work. I have one dabbed coat of Royals over Barielle Rain in Spain. Topped with Glossy Glam. 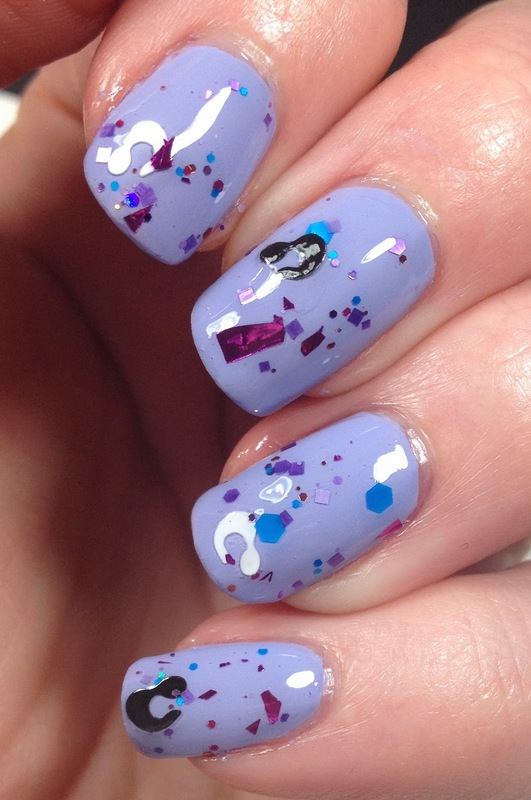 The shop describes this as a limited edition glitter topper that's jam packed with black & white leopard spots and blue & purple glitters in various sizes". The shop also notes that a good shake is needed due to the size of the glitter! The last one I have is Peppermint Bark and the star of this polish is the candy cane shaped glitter. I dabbed one coat of this over Barielle Irish Eyes and topped it with Glossy Glam. You will need to fish these out of the bottle. In addition to that, because of the shape of them you will need to be extra careful of them as they will probably get caught on something if you aren't careful. This is the perfect holiday dinner topper/special occasion topper! The site says this is "a limited edition glitter topper that's jam packed with red & green candy canes and red, green & white glitters in various sizes" Yes there are green ones in there, but they didn't want to budge! My favorite of the bunch was Snow Angel, how about you? Nice swatches of these! 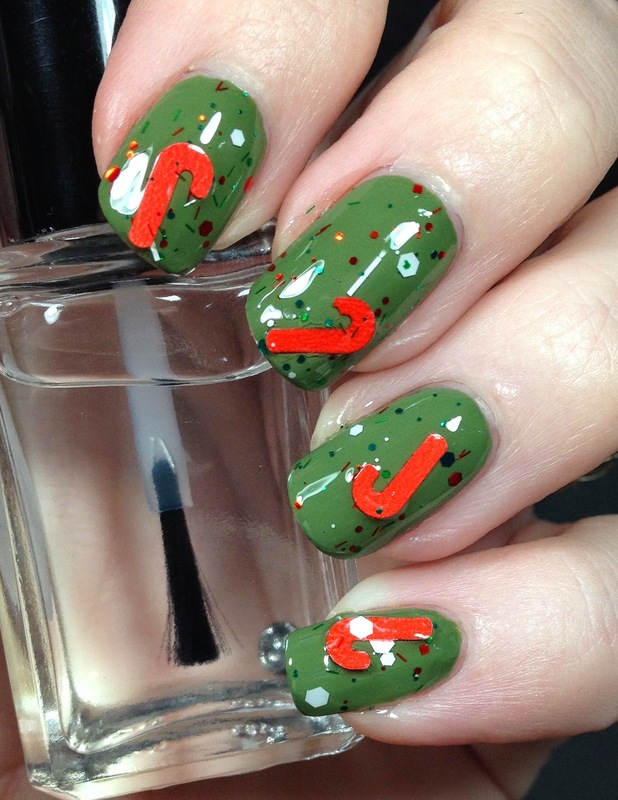 I've never seen candy cane glitter too.